As discussed, I'm rolling out a simple in-talk bug reporting system. If you like and have time, you can add bug-tracking status to existing bug threads. All you can do now is mark it, and assign it to a category. That would, however, be helpful to me. I'm working on the page that summarizes bugs, both by category and status. Bugs on threads older than September 1, 2010 are now allowed, at least at present. I don't want to flood the system with bugs based on code too different from that in place now. Is the box on the right supposed to show for any thread in the Bug Collectors group? Because I'm not seeing it on any of them. You left out the adjective in the text that's shown when attempting to report a bug that isn't in the accepted date range. No. You have to report it as a bug, with "make a bug." We could, I think, make it automatic when you post to bug collectors. But it's unclear how you'd decide which classification it goes in. Now I'm seeing the boxes but only on threads that you've already "made a bug". Are you sure that you don't have some switch in there that only allows you to see it when it hasn't already been bugged? 6> Nah, I actually don't think making it automatic in BC would be helpful to you. There's a LOT of stuff reported there that's not bugs, and you have a lot of willing helper gnomes to mark actual bugs as bugs. I see the Make A Bug link on the left now. Never mind. What determines if the Make A Bug link is shown or if it's hidden under "More Options"? My guess is that it's group based. BC and RSI seem to have it non-hidden. Makes sense, but I think Talk about LibraryThing should possibly belong in the same category. They seem to have around the same number of bug reports as RSI. Hopefully high on your priority list is something to let you point to a message in the thread in which the bug is mentioned. I can see this being useful when I thread goes a couple dozen messages before someone realizes the behavior is a bug, goes off on a tangent about a bug, etc. Might save you a bunch of messages trying to figure out which thing being talked about is the bug. 11: At that point there's a good chance that it would be better to start a new thread with a subject that more clearly describes the bug. Edited to add: a link to post a new message from the summary page would be good -- I find myself going there to check if a bug has been entered, then having to go back to the group page to post it. The Find Out More link on the bug sidebar doesn't work when I click on it. Cool feature though! Would it be useful if we could see from Talk, or at least from the Bug Collectors group, which threads had been marked as containing bugs? You'd think all, but sometimes that's not the case. Also, should we mark a bug if we're not quite sure it's a bug? That's what the not-a-bug (or whatever) status will be for, right? It would be nice if we could choose multiple categories for a bug. > 17 Maybe follow the starred functionality. Bug threads have a grayed bug icon and you click on it for a green "starred" icon to follow the thread. >1 timspalding: Bugs on threads older than September 1, 2010 are now allowed, at least at present. I don't want to flood the system with bugs based on code too different from that in place now. Assuming that you meant "not allowed", should we make new threads for long standing bugs after we verify that they still exist in current code? Wow, I am very impressed. I think that, especially with the category bit and the 'bugs.php' page, this does a /lot/ of the things members were asking for, plus keeps what you like about Talk! And I think that bugs page makes it easier to 'search' to see if bugs have already been posted. Mostly I just want to say thank you for taking the time to do this - it's one of those things where it's so very clear that LT really listens to its members and what we want, even when it's at least a little at odds with what you might want! Yes, that's my feeling. Think of it like a statute of limitations. We don't prosecute someone for punching someone out when it was done 30 years ago. Memories fade. Witnesses move away, etc. The same applies here. A bug from long ago is describing a different code base than what we have now. That said, I was being conservative in making it only a month. I may extend it to two or three later today. Yeah. Not written yet. Probably it will point to the blog post, when there is one. Yes. I think so. I'm thinking that I'll make a central setting for whether to show bug issues or not. If you are showing them, Talk gets another column for whether there's a bug--and the color of the bug is the status. No, I think not. Ultimately, this is a tool for me and other LibraryThing staff. I want to get a sense of what's out there. Multiple categories would make that harder. I will be able to change where a bug belongs, and, well, my word will be law there. There is, of course, some use in the classification for you guys. It's useful when seeing if something has already been reported, for example. But mostly it's for me, so my rules will prevail. Yes, if you can. That has the virtue of giving me something "clean." Link to the old one, if you will. I've been having trouble replying to threads. It's slow -- and that's on top of any long-thread slowness -- and I get "URL not valid" type errors the first time I click submit. Is this related to the new bug tracker? No. We're fighting a spam bot, I think. Ugh. That would be a nightmare. Of course, I'm used to larger companies than LT, so maybe the mapping of bug category to assigned developer is looser here, but that would still be a logistical pain. If you really can't choose one, how about creating two related bugs for the different aspects of the problem? Think of it like a statute of limitations. We don't prosecute someone for punching someone out when it was done 30 years ago. A bug from long ago is describing a different code base than what we have now. If a bug existed two years ago and it is still happening today then it' still a bug. Even if all the code changed, nothing has changed from the users perspective. ETA: Of course if you do allow really old threads to be marked as bug threads, you should make clear that they need to verify that the old bug is still happening first. Could the "find out more" link in the bug sidebar be linked to this thread until the blog post is done? Just wanted to add my thanks. Its great that you have taken the cry for bug-attention to heart. Its really cool how you have turned that into a new feature thingy - which I think you prefer to extermination. Killing two bugs with one stone. Thanks. I'm rolling out other parts bit by bit. My argument is that there are an infinite ways of putting semantic content into status. Something can be closed because it's a bad idea, or because it's impossible, or because it's not a bug, or because it's two bugs, or because the code is in flux and won't be an issue soon, and on and on. So, rather than try to represent all that, I'm going to have a simple "closed" status, separate from "fixed," with differentiation over who closed it--simply so people, including me, can look at things closed by others. The colors will be the color of the bug icon, and show up next to the thread. Will 'Closed by member' be any member or just the member that made it a bug report? I was just posting about this in the other thread. I think I'd like to distinguish between "Closed by X - Might be worth revisiting later" and "Closed by X - better forgotten". I had the same thought. But I think that, if it's marked separately, members and I will police it well enough. Oh, I have another proposal. How about if ONLY Bug Collectors get the bug structure—and they always get it? That's just SIMPLER. People are clearly confused by the idea that bugs are ADDED to posts. Vote: Tim is right here. 34> It does seem like a cleaner solution. I think it would promote people actually posting a more helpful writeup in BC for bugs that are pointed out in other forums. >34 timspalding: Does that mean the first poster has to deal with the bug classification, etc.? That seems like it could discourage newer members from reporting problems. Also, I recently started a thread here for listing bugs that had been fixed. It wasn't itself a bug report. Should it have gone elsewhere? 37> Yeah, I missed the "and they always get it" part. Probably would be best if it was left blank by default. Tim, did you push something you didn't mean to? There's a broken-link image trying to appear on each topic on the Talk page and the Groups topics listing pages. ETA. I'm at work and on IE7 which may be relevant. Hey Tim, for clarity - could the status of a bug be displayed as ALT text on the coloured bug icons or something? >43 AndrewB: I was going to pop in to say that I think green for both 'closed' and 'fixed' is not a good idea (they are very very different things!) - but my concern would be lessened a bit if we have alttext mouseover. Basically I think we want to be able to see the difference between 'not fixed' and 'fixed' at a glance. I don't think I like the idea of members closing bug reports. Will members be able to reopen them after some other member closes them? I also missed the "and always get it" part of that question the first time so I changed my vote from yes to no. i like the idea that all bugs have to be reported in this group, but I don't think every thread should have to be one. I've been watching the Bug Collectors, but am not a member as I am of other groups. When I stopped watching, I wasn't given another option, so I started watching again. Soon the community police will drop by and accuse me of peeping. Is there a more formal way to become a Bug Collector? Or is watching sufficient? It might help if it were explained somewhere obvious and easy to find. I don't think it's the former, and it certainly isn't the latter. 46> All standing groups can only be watched, not joined. We're all peeping. Yes, but that makes Tim's idea in #34 a bit strange. So 34 means: if you're "watching" Bug Collectors, you will see bugs. If you don't, there will be no bugs? I assumed he meant threads posted in the Bug Collectors group, not users who were members of the group. I.e. Get rid of the "make a bug" button. If it's posted in Bug Collectors, it's a bug, and automatically has the bug tracking fields. And, presumably, you're either forced to enter a bug category or it starts out in an "Uncategorized" category. Good interpretations, hopefully Tim will confirm it. So "they" in his >34 timspalding: referred to posts / threads in Bug Collectors, not LTers who've joined Bug Collectors (since joining isn't an option). This implies whenever a bug is posted in another group, someone should re-post it here to formally add it to the bug tracker. Which in turn implies many Bug Collectors posts will not be authored by the author of the original post. That is consistent with how things are done here, and I think it works well, just working out the process in my head. It occurs to me perhaps a Bug Collector medal is in order, it would be a service to LT. Perhaps a bug icon with a pin in it! 53> In one of the other bug-related threads, I believe Tim confirmed that he'll eventually do helper badges for bugs. Tim> Could you make a link on bugs.php that will show all bugs, regardless of status or category? Maybe a link under Status that says "All". I'm just browsing through them, reading and sometimes commenting. But I have to click on every status to make sure there's none I missed. Well, now that that pony has a waiting line for it, it's time to trot out another. It's been suggested before in the past that a thread has a visual indication that an LT staff member has posted to it at any point. Something that tells you the staff has at least looked at it. This would be extremely helpful in this new bug system. I think it'd be helpful for us as well as the LT staff. The one reason I'd see not to do this (other than the effort), is if "Assigned To" makes it moot. If "Assigned To" starts out as empty and the LT policy is that the first staff member to post to a bug also assigns it, then this pony wouldn't be as useful. But I would think a policy like that might be a bit hard to stick to. Maybe disable the button after about five or so members have reported it, as you don't want to go spamming the log. I think this would help out, especially if it required the verifier to enter data for browser/operating system. Where are people seeing colour coded bug icons? I must be missing something. Ah, thanks bc. I didn't click through to the statusseses because they would all be the same, but I didn't think to click through to the categories. Very cool with the colors but there needs to be a key, so you know what each color means. 63> Yeah, there does. I imagine Tim will eventually make one. But for now, you can easily figure it out by clicking on the various statuses and see what their colors are. fwiw i really like this bug tracking system. way better than others i've experienced as a user. agreed, lquilter. It's so integrated ----handy. I would like more bug colors, though. And I am quite sure lorax would want a blinking bug. More than three colors? They come in red, blue and green now! 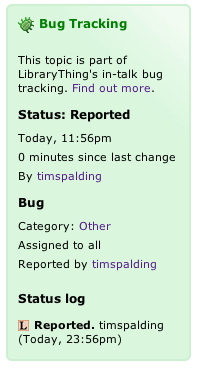 Yeah I'm loving the bug tracker too - it's taken us a few years to get one, but we're there! It's like the best present evah! In my code bugs have a cloaking device. They can't be seen when being written but they de-cloak at compile time or later. Some of the bugs in which the force is strongest (to mix tropes) can stay cloaked until I'm demonstrating the application to the paying customers! Let me disclose the central problem I'm working through. Bugs are essentially Talk--bugs.php is just calling the Talk stuff, and could well be under Talk itself. The problem is providing access to the feature--an easy way to get there--without making it a first-class "The World" feature. That is, "bugs" is a concept like "All topics" and "Hot Topics." Certainly it doesn't belong under "Your World." But putting it in "The World" gives it too much prominence. New users will be confused. You assumed rightly. Sorry for not being more specific. I'm thinking that closed bugs could be an animated gif of a bug turning into a butterfly and flying away! They need to start mating. I think you need to distinguish between what's "essentially Talk" and what actually is Talk. Even though this is based on the Talk system, I don't think it fits in as a part of Talk. There should be a separate page for viewing Bug Talk. Viewing Bug Talk should not affect our settings for regular Talk. And where's the link to get to it? By the way, I'm surprised nobody wants to sort by date of last status-change. I'm going to add that. How about if you watch the Bug Collectors group, it shows up under Your World... Hmmm... Maybe if you don't watch the BC group, it's hidden behind the (more) link, but if you do it's always visible. Another possibility would be that the area/status filtering stuff appears on the BC group page (http://www.librarything.com/groups/bugcollectors), but personally I don't really like that because I never use the group pages except to post a new message. There should definitely be a link to it from Help. I think that's where most people would look for it. 75> I've been holding off on requests for sorting because I figured it was on your plate. Shall I release the ponies? Thanks. That was exactly what I was thinking now. 1. If you are a member of BC--I'll make it a member thing again--then you see it always. 2. If you are not, and you hit a BC post, the bit on the right invites you to join, and gives you a link to the bugs view. Agree with Zoe 73. While this uses Talk infrastructure, it's not inherently of interest to Talk. (1) Include it under "standing groups" (already is) as a parenthetical link with the "bug tracking" item. I see that Ignored are hidden behind a "more" link beneath Your World. Could include bugs there. I'd like to be able to see that last status as a separate thing, so we would actually have a list of outstanding bugs and easily be able to check to see if they've been fixed. Agree that bugs.php should be available under 'more'. Also would like to see it under Help - given the changeable way Help works, though, it's a bit difficult. Perhaps it could go in the 'this is a HelpThing' page sidebar. Something short and sweet like 'Found a bug? Report it!' with a link to the group itself (which will then presumably have instructions and bugs.php prominently displayed). > 84 I agree that there needs to be something between 'reported' and 'fixed/closed'. I personally would really like to see 'assigned' (this is being actively worked on by an actual person) and wouldn't mind something that gets at brightcopy's notion of something along the lines of 'tabled' (this is a bug but it's just too big to deal with right now for some reason). 86> "Deferred" is usually the preferred term. But I'd settle for table, if Tim would embrace it. I'd be happy getting to the Bug Talk page from a link in the Bug Collectors group description. Actually, it would be really interesting if all groups had this functionality... the group owner could come up with a list of categories and members could classify the threads in those categories. Just a note on the connection between joining/watching BC and having the bug info. I participate in BC, but I don't join it. Normally, it has a TON of stuff I just don't care to read. This recent bug feature has drowned those out for the present with real bugs. So a feature that requires joining BC to have bugs show up under Your World doesn't sound so great to me. But it's not a huge deal for me, personally, as I'll just greasemonkey it up so I have a link to the bugs wherever I want it. But there are probably others like me on this aspect that don't have that ability. You'll still be able to get to it. But you'll have to find the link elsewhere. 90> That's my point. Somewhere else that's inconvenient. But like I said, no skin off my nose because I'll put it where it's convenient. I don't think Tim should have closed my Image bug. He is even asking me to provide more examples. How can that be closed? This is a gray bug. It is misunderstood. I'd really prefer to keep this more distinct from Talk. > 92: You can reopen it by setting it to "needs discussion". Purple is for bugs you wish you had. that's right. i wish mine were purple. Yet there are no Uncategorized bugs, and when you click on it you simply get no bugs listed below. Fixed. There were topics I had deleted, but didn't delete the bugs. 99> Shouldn't "Needs Discussion" be counted in the active bugs count? At present, it appears not to be. ETA: Also, when you get a chance, the current bug category/status you have selected on the bug list page could use a little visual indicator. Yeah, "Needs discussion" should be counted as active, especially because for a while at least members couldn't re-open a bug, only change it from "closed" to "Needs Discussion", if another member had mistakenly closed it. Yes, my major bug was marked as fixed and it most certainly is not. It looks like it's all cool though, with the blue bug and the discussion needed thing. What happened to "Uncategorized"? It used to be a category but now it's gone (even though I'm looking at an Uncategorized bug). I used to check it every so often and categorize the bugs there. It only shows the categories that have at least one. 104> Maybe it's a caching issue? I had thought perhaps it was that, but I was looking at an Uncategorized bug and hit refresh on the bug list. Still no Uncategorized. Maybe I screwed up somehow. I will refrain from categorizing the next one and check again and let you know. For now just assume I'm wrong. BTW, has it gone far enough that we should open bugs about the bug system? Earlier you weren't too keen because it was still in flux. Just wondering if it's settled down enough. ETA: Yeah, I think I must have just opened a bug report in one window and then someone categorized it before I opened the bug tracking list. I just tried it with two Uncategorized bugs and they showed up. Probably shouldn't post here anymore.